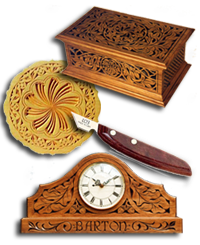 For carving, you’ll hold the cutting knives one of two ways . 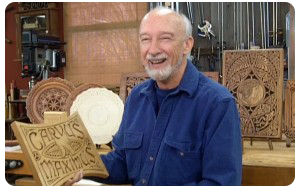 . .
To begin, sit down in a chair without arms (the chairs),and hold the workpiece on your lap. Grasp the knife in your right hand (or left if you’re left-handed). 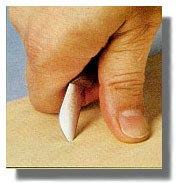 Place the first joint of your thumb, at the blade end of the handle, and wrap your fingers around the handle as shown below. Then turn the inside of your wrist toward your body and rest the tip of your thumb, the knuckle of your index finger, and the point of the blade on the workpiece. This lays the blade away from you at about 65 deg. to the wood. Viewed from the side, an imaginary line bisecting the angle formed by the point of the knife should stand perpendicular to the workpiece. 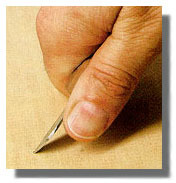 Move your hand and the knife as a unit; that is, don’t flex your hand to draw the knife toward your thumb. Maintain a constant angle between the blade and the work. This is used for the first and third cuts of a three-cornered chip. Also, for all the other cuts when carving. Tilt the top edge of the knife toward you, and place your thumb along the back of the blade. 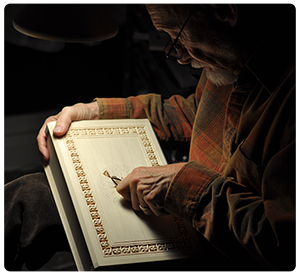 Rest your index finger knuckle on the carving to maintain a 65 deg. tilt of the blade, shown to the left. This is used for the second cut of a three-cornered chip and making a “flip-flop” notch. Grip the knife as you would an ice pick. Hold it perpendicular to the workpiece with the long point away from you, and stab it straight into the wood. Then rock the handle toward you to extend a line out from the knifetip impression.